Recipients will undoubtedly appreciate the comfort and attractiveness of our round shaped stadium seat cushion. Stadium cushions will not absorb water. Their long lasting quality ensures that your message will follow fans to sporting events for many years to come. Please specify imprint position when ordering. The handle can be at the top, bottom or either side. 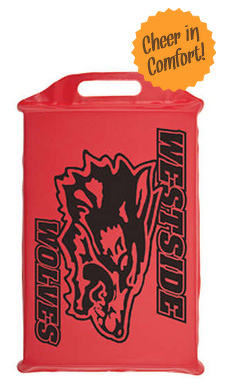 Designed for 11" round stadium cushions and made with our premium, ¾" thick closed cell foam material. Order yours today! *For Round cushion only- Key Float handle is left in cushion. Print 1 line of straight-line copy only at no additional charge. Great for web address or phone #. If no copy is indicated, will be left blank. Chains not attached. Cushions arrived promptly. Seemed to be a bit of a disconnect between vendor and creator as far as imprint area sizing. My fault that I didn't actually think about how big these were going to actually be when you sit on them, they are small, more child size. But they look great and I am happy with them. Creator was very helpful.